Product prices and availability are accurate as of 2019-04-19 02:09:06 UTC and are subject to change. Any price and availability information displayed on http://www.amazon.co.uk/ at the time of purchase will apply to the purchase of this product. A Lakeland enthusiast of the first order, and a native of Barrow-in-Furness, Harry Griffin wrote about the Lake District for a variety of northern publications for more than fifty years, including the Country Diary of the Manchester Guardian (later the Guardian), Cumbria magazine and the Lancashire Evening Post. The selection in "The High Places" is from the last of these, and is illustrated with sketches by Alfred Wainwright. For almost 30 years Griffin wrote a weekly feature called 'Leaves from a Lakeland Notebook' for the Lancashire Evening Post. This book combines a selection from around 1500 of these articles with illustrations from A. Wainwright. 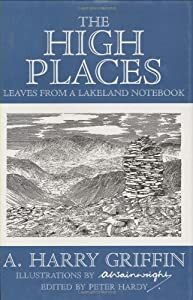 For more of Harry Griffin's Lakeland articles see "Heritage of Lakeland" which in addition to his work for the Lancashire Evening Post includes selections from from more than fifty years of writing for the Guardian, plus pieces which appeared originally in Cumbria magazine.